My life inspires so many desires! Patrick Caulfield studied at Chelsea School of Art, London from 1956 to 1960 and at the Royal College of Art, London from 1960 to 1963. He returned to Chelsea School of Art to teach from 1963 to 1971. Caulfield's first solo exhibition was held in 1965 at the Robert Fraser Gallery, London. His international reputation was quickly established and a string of one-man shows of his work were held in the UK and in many countries throughout the world. 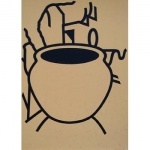 His first print retrospectives were held at Waddington Galleries, London in 1973 and at Tortue Gallery, Santa Monica, California, touring to Phoenix Art Museum, Arizona in 1977. Subsequent retrospectives were held at the Walker Art Gallery, Liverpool ('Paintings 1963-81'), touring to the Tate Gallery, London in 1981; Waddington Galleries, London (1981); Nishimura Gallery, Tokyo (1982); Arnolfini Gallery, Bristol (1983); Museu Nacional de Belas Artes, Rio de Janeiro (British Council print retrospective) with a subsequent tour to 12 venues in South America (1985-87) and 3 venues in Portugal (1989-90); and Cleveland Gallery, Middlesborough (1988). More recently, retrospectives have been held at the Serpentine Gallery, London (1992-93), the Alan Cristea Gallery, London (1999) and at the Hayward Gallery, London (British Council retrospective), touring to MusÃ? ?Ã?Â©e National d'Histoire et d'Art, Luxembourg, Calouste Gulbenkian Foundation, Lisbon, and the Yale Center for British Art, New Haven, Connecticut. Caulfield's work has also been included in numerous key group exhibitions throughout the world since 1961. Among Caulfield's many commissions are the design of the sets and costumes for Michael Corder's ballet 'Party Game' for the Royal Ballet at the Royal Opera House, Covent Garden in 1984. He went on to be commissioned to design the carpet for the atrium of the British Council offices in Manchester (1991) and to design a giant mosaic entitled 'Flowers, Lily Pad, Pictures and Labels' for the National Museum of Wales Cardiff (1994). In 1995 he designed the sets and costumes for the production of Frederick Ashton's 'Rhapsody' at the Royal Opera House, Covent Garden, which went on to be performed at the Opera National de Paris in 1996. Patrick Caulfield was joint-winner of the Jerwood Painting Prize in 1995. In 1996 he was awarded the CBE, and received an Honorary Fellowship of the London Institute. Patrick Caulfield died in 2005.